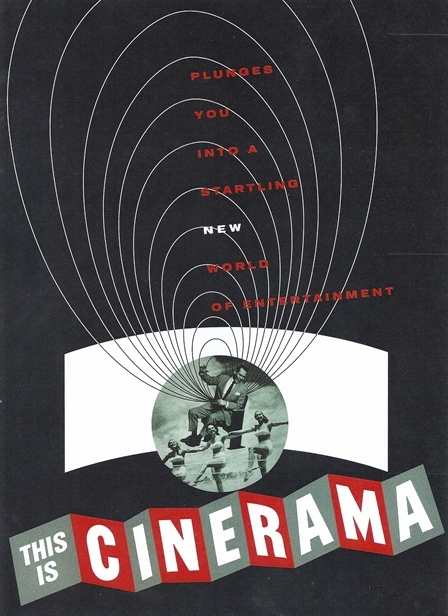 It was Merian C. Cooper who came up with the perfect way to introduce Cinerama to audiences. To do it he took a cue from his alter ego Carl Denham in his most famous picture, King Kong, and the way Denham introduced the giant ape to New York. Spectators at that first showing on September 30, 1952 walked into an auditorium dominated by a huge curved wall of wine-red curtains. As the house lights dimmed, they heard the Morse Code dit-dit-ditting that was familiar to them all as the intro to Lowell Thomas’s daily radio program. The red curtains parted slightly, and there was the image of Thomas himself, in black and white, on a standard-size movie screen, welcoming them. My own father’s reaction was more succinct. My uncle took him, my mother and my grandparents to see This Is Cinerama when it opened at San Francisco’s Orpheum Theatre on Christmas Day 1953. As the curtains opened and the rollercoaster burst into view, my father reared back in his seat, his eyes bulging from their sockets, and bellowed at the top of his lungs: “Jeeee-zuss Christ! !” He may have been more vociferous than anyone else that day, but every single person in the Orpheum had exactly the same reaction. I know because when my own turn to see This Is Cinerama came 11 years later — even after a decade of CinemaScope, Todd-AO, Panavision, VistaVision, and all the other scopes and visions Cinerama had inspired — that Great Unveiling had lost none of its power. No two ways about it, this was — and remains — the greatest knockout punch in the history of motion pictures. That first showing had been a mighty near-run thing. The entire feature had never once been run through the projectors — not until the first audience saw it on opening night. With three projectors running in interlocked unison, the standard practice of switching reels every 12 or 13 minutes was clearly out of the question. Special reels, nearly three feet in diameter, had to be built so that each half of the feature could be run without interruption, the only reel change coming during intermission. Two days before the premiere it was discovered that Act II was too long even for those; the film overran the reels by several hundred feet. With no time to make more reels, everybody cringed, rolled their eyes, took a deep breath and decided to hope for the best. They made it almost all the way home — but during the closing credits, the film finally slopped off the take-up reels and jammed the projectors. Actually, This Is Cinerama wasn’t really a movie at all; it was an early example of something there wouldn’t even be a term for until decades later: virtual reality. It filled your entire field of vision, 146 degrees left to right, 55 degrees top to bottom (each frame was half again as high as ordinary film, spanning six sprocket holes instead of the standard four). It projected at 26 frames per second instead of 24, lessening the flicker that is always perceived (if only subliminally) by the human eye, and brightening and sharpening the image perceptibly. The sounds didn’t sound recorded at all, and they came from wherever on the screen the images making them were located; musical passages seemed to come from an enormous, invisible orchestra and choir all around you. 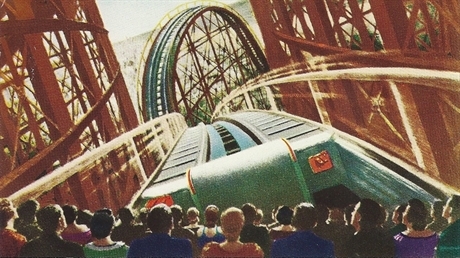 The postcard image above, an artist’s rendering of the Atom Smasher ride, and the photo on this souvenir program of a theater patron gazing with delight at the bathing beauties water-skiing all around him, are in fact accurate depictions of how audiences perceived the Cinerama experience. Still, Cooper was right. 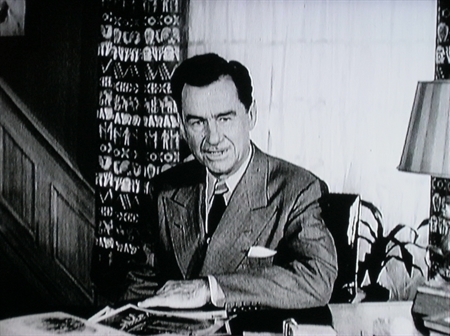 He and Lowell Thomas and (especially) Fred Waller had revolutionized the picture business. All those Hollywood moguls who had trekked out to Waller’s workshop in Oyster Bay, Long Island, marveling at his demonstration reels but declining to buy into his process, now found themselves scrambling to come up with some variation on Cinerama for themselves. Darryl Zanuck’s 20th Century Fox was first out of the gate in September 1953 with The Robe in CinemaScope (“the poor man’s Cinerama”). Other processes followed, all of them more visually impressive than standard 35mm but none with the sense of audience envelopment Cinerama conveyed; Waller’s process remained the gold standard. Cinerama entered the culture and the language. There were pop tunes about it (“Oh wide-screen mama/Don’t you Cinerama me…”). The very name Cinerama — a portmanteau word blending “cinema” and “panorama” — influenced American English in ways that haven’t entirely disappeared even now. Everything, it seemed, had its “rama”: laundromats called themselves Launderama; florists had Flowerama; fast-food joints became Burgerama; car dealers became Autorama or Motorama; Kelvinator came out with a Foodarama refrigerator; and, inevitably, burlesque stripper Mavis Rodgers billed herself as “the Sinerama Girl”. Fred Waller and Hazard Reeves received special Academy Awards at the 1953 ceremony in March 1954, Waller “for designing and developing the multiple photographic and projection systems which culminated in Cinerama”, Reeves for developing “a process of applying stripes of magnetic oxide to motion picture film for sound recording and reproduction.” Two months later, almost to the day, while This Is Cinerama was still playing to sold-out houses at the Broadway Theatre, Fred Waller died of a heart attack at 67. It may seem tragic, to be taken away at the height of his fame after the vindication of his long struggle to bring Cinerama to the public. In fact, however, it was the act of a Merciful Providence. For Waller was spared the heartache of seeing what would become of his brainchild in only ten short years. You must be a Stan Freberg fan from way back if you recognized that quote from "Wide Screen Mama Blues"! Do you by any chance have Rhino's Tip of the Freberg collection? Four CDs of almost everything he ever recorded, plus a VHS cassette of his TV commercials. A premium collector's item new, now, but used copies are still affordable, and well worth the price. 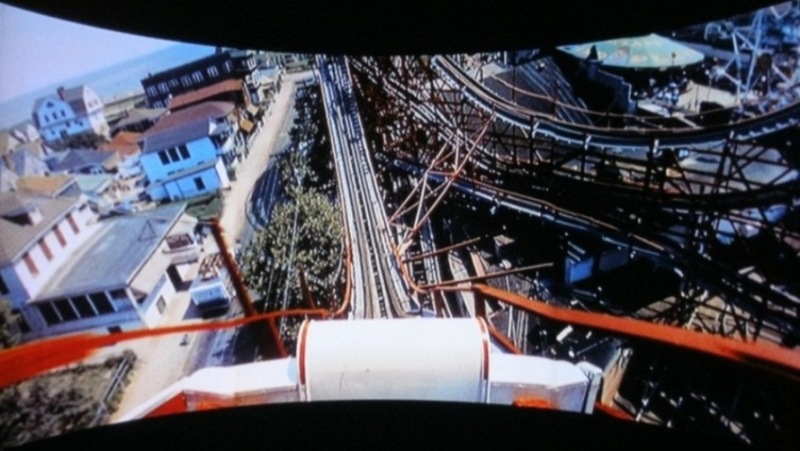 The most amazing wooden roller coaster in the world – I worked on the Cinerma Coaster at the age 16. When it came my time to actually see the movie in the theater – I had no idea what I was about to experience. All of a sudden I was re-living the best ride of my life. How do I describe the experience? FIERCE !!! !